(NaturalNews) At the time of this writing, news about the horrific mass shootings in San Bernardino, Calif., is still unfolding. There are a great many details that have not yet become clear, except that more than a dozen people have been killed, many more wounded, and that the shooters targeted the Inland Region Center, which provides assistance and care for disabled persons. Also, at this writing, a terrorism link has not yet been established or ruled out – understandable given the recent attacks in Paris, where ISIS-sponsored gunmen killed 130 people and wounded scores more. Authorities are also fairly certain there was more than one gunman, that they were heavily armed, sporting military-style gear, hoods and semi-automatic rifles. What is less certain – in fact, what is a downright mystery, both to me and tens of millions of my countrymen – is why, oh why, there continue to be "gun-free zones" in a nation whose founders sought to ensure that none of their progeny would be without a means to protect themselves and their families unless they made the personal choice to be vulnerable. 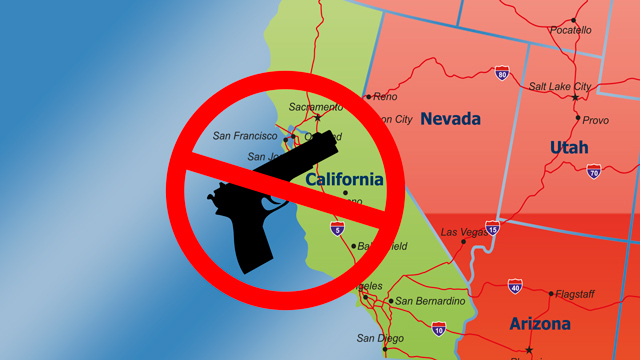 And honestly, California is one of the worst offenders, featuring strict gun control laws, byzantine gun licensure processes and a ruling class that is at once protected by men and women with guns but disavowed of any obligation to allow those they rule the same right. Police are continuing to sort through evidence as I write this. They have yet to identify the perpetrators of this violence, let alone locate them. Soon, families of the victims will begin to mourn, with many angrily denouncing the assailants and, sadly, many calling for even more laws and regulations that will result in more deaths, more funerals and more heartbreak for more families in the future. Like Parisians in November, San Bernardinians victimized by this latest attack had no choice but to cower in place and wait for armed police to rush in and save them. Only, as usual, armed police are never at the locations where the deranged come to slaughter, at least not initially. They do get there, eventually, but not before the maximum carnage is inflicted on bewildered and vulnerable citizens, many of whom became victims against their will. Not that it made a difference in Paris, of course, where police, who are unarmed, themselves, have no option but to cower in the face of armed and determined criminals and terrorists. The irony is not so sweet; in the U.S., following such incidents, cops that resemble soldiers fill the streets following such mass murder events. In France, actual soldiers, with body armor, are deployed. Will anyone in power do the right thing – finally? But what are they protecting, really? Because by the time these assets are deployed, the murderers are often long gone, and while they are most often found at a later date, in another location, the carnage has been committed, the damage done. And there is no going back in time to reverse it. Yet our "leaders" keep doubling down on vulnerability. And stupidity. And taking chances with our lives. They force companies to spend scarce resources to provide employees with training in "active shooter drills," and require them to "practice" responding to a situation that, honestly – unless you've been around "active shooting," as in a war zone – most will have no idea how they'd really react. How about, for a change, we alter our direction? How about instead of mandating more gun-free zones, we start building some "universal protection zones," where citizens are free to utilize their Second Amendment right to protect themselves, and their spiritual right to self-preservation? We've done the vulnerability thing time and time and time again; let's try the "self-defense" and "self-protection" thing, okay? Is anyone in Washington – or Sacramento – listening? It's doubtful; they're too busy looking for a way to exploit this tragedy for political gain to do the right thing.